In our modern era, to exist is to feel fragmented, our attentions splintered by a dozen different devices and our politics bifurcated by the need to balance a conscience with convenience. Are we part of the earth or powerful over it? Do we need spirituality and society more than they need us? These are some of the questions at the anxiously beating heart of One. One & One, the 25th-anniversary production of esteemed Israeli dance company Vertigo. With a stage covered in rich, dark soil and music that pivots among moments of classical mannerism, electronic bombast, and folk simplicity, One. One & One explores the fundamental tension between humanity’s desire for solidarity and the separation that comes with tending to one’s own needs, from the mundane to the messianic. Vertigo has grown steadily from its humble beginnings a quarter-century ago, when young choreographer Noa Wertheim and erstwhile air force pilot Adi Sha’al began meeting in the dance studio in part to explore their budding relationship. They are now married parents at the helm of one of Israel’s largest dance organizations, which has in turn launched a sustainable communal living-and-teaching space and a sizable education network. 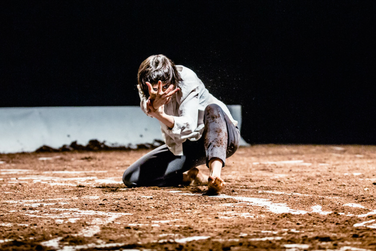 Their groundbreaking productions have candidly explored politics, sexuality, physical handicaps, and other socially salient topics, using visceral and athletic choreography to pull dance into urgent international conversations. Choreographed by Wertheim for a full cast, One. One & One pushes us squarely in front of a mirror and demands we reckon with what we see.